This article discusses 802.11 wireless, basic and supported data rates as well as some details to take into account in high-density scenarios. Compared to PHY Data Rates, Throughput represents the actual, achievable TCP data pushed between two wireless stations. Basic & Supported Data Rates for the wireless local area network (WLAN) are included by the access point in the broadcast beacon, which indicates to potential clients whether or not they can associate with the advertised wireless network, as well as the speeds at which particular data can be sent (basic = broadcast/multicast). By default, the UniFi Controller disables the slowest 2G rates, which prohibits slower, legacy clients from joining the WLAN, while also discouraging high-airtime consumption transfers (e.g., broadcasts) due to low data rates. By default, UniFi leaves all of the basic 5G data rates enabled. Figure A: The first WLAN consists of a UAP-HD capable of up to 1733 Mbps PHY rates with high SNR, VHT clients (i.e., laptop clients). By consequence of supporting the lowest data rates, a weak signal client (the mobile client) connected to the UAP-HD can cause the aggregate WLAN speeds to reduce dramatically. Figure B: The second WLAN consists of two UAP-HD, strategically placed to provide comparable coverage but with stricter data rates enabled. By disabling the lowest data rates, clients are more likely to remain connected to the AP with the best signal possible, resulting in maximum allowable throughput at the UAP-HD. However, in High-Density WLANs, where airtime efficiency is critically important to the overall performance of the wireless network, carefully consider adjusting the 802.11 RATE AND BEACON CONTROLS—albeit with extreme caution. Improper configuration of this advanced feature can lead to disruptive performance or widespread connectivity problems for clients throughout the WLAN. 1. Navigate to Settings > Site. 2. Within the Services section, check the box for Enable advanced features. 3. To configure these settings, now navigate to Settings > Wireless Networks. 4. Either Edit an existing network or Create New. 5. 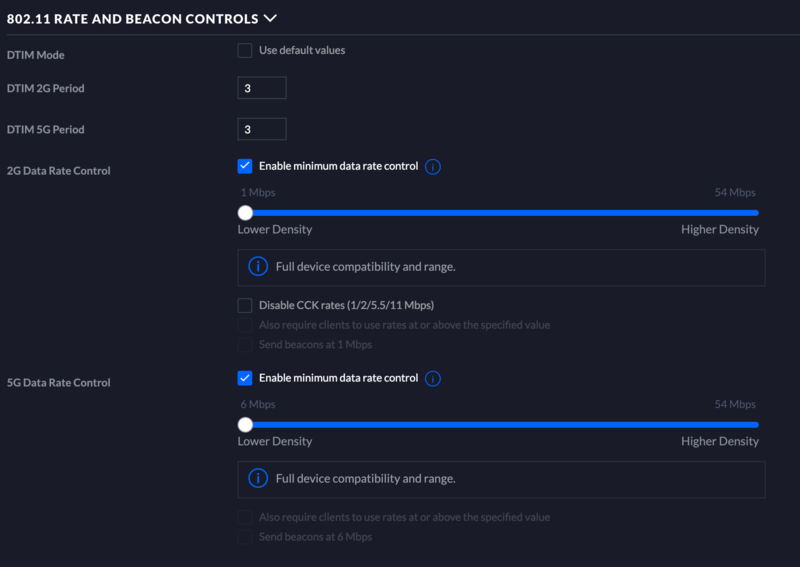 Under Advanced Options scroll down and click on the + to expand the 802.11 RATE AND BEACON CONTROLS section. If after Enabling Advanced Features and Applying the changes, you do not see these settings in the Wireless Networks, verify that you are running the most recent firmware (for the Controller, related devices, and Cloud Key if applicable). Forces “sticky” roaming clients to re-associate to another AP. If the WLAN is well-designed/implemented, the new AP to which the client roams will offer a better signal and have a twofold impact on improving that client’s speeds as well as the aggregate performance of the previous BSS, since low-rate clients no longer drag down the airtime. Reduces the likelihood of channel contention (the probability of signal collisions at receivers in the WLAN) since there is less overhead from associated clients within the BSS. With low data rates disabled, clients transfer data as quickly as possible—then remain quiet. This frees up the WLAN for other clients that need to use the channel. Lessens the probability of hidden nodes on the network since associated clients are within close proximity of each other, and therefore, able to 'hear' whenever a transmitter is actively using the wireless channel. Complementary code keying (CCK) rates are used in conjunction with 802.11b WLANs. When the "Disable CCK Rates" box is checked in the Wireless Networks settings, CCK data rates 1/2/5.5/11mbps are disabled. This only disables the CCK data rates and does not affect OFDM rates that are in the range of CCK rates. OFDM will still allow for 6/9mbps data rates when CCK rates are disabled.